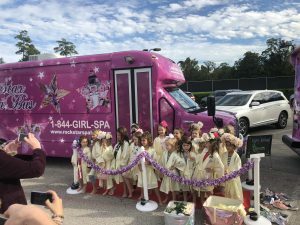 Are you on the lookout for Katy TX princess parties near me? Well, in order to do that you’ll have to know what your options are. When it comes to a princess, she must have a very specific kind of treatment. The royal kind, in fact. To be frank, there are just not that many choices available for parties that can produce that kind of lavish effect. It’s not to say that they won’t be fun, and certainly, they’ll be a good time to look back on. However, a party for your little girl should be above and beyond good and fun. It should be something that she remembers for a lifetime as the party that truly gave her a wonderful and fulfilling time. How many parties do you know of that provide productive and body-positive results just from the actual event itself? A lot of the times it’s just a blown up bouncy castle and a big cake. The two hardly intertwine well and they definitely don’t leave you with clean pores and super soft skin. Rockstar Spa bus, on the other hand, will provide you with these essential spa treatments and then go even further. We have all the amenities that one could need to create the perfect princess party. No bland cop-outs, no beating around the bush, it will be lavish and luxurious. Exactly how she deserves it. This will be a moment the kids will cherish. Royal treatment is in order, and we can’t wait to pamper and spoil your birthday girl! What Kind Of Options Does The Spa Bus Offer? Our bus is filled to the brim with the most exquisite amenities that will make your girl’s heart soar. The first thing you will notice when you see our bus arrive is the sheer size. When we roll out the red carpet and the shimmering brass dividers it looks like an opening night at the cinema. As you walk into the bus you will find that it is completely designed for the tastes of a little princess. All of the walls are shaded in bright pink. Laser lights swivel and shine all throughout the bus, and they illuminate the whole bus with such a fun energy. There are huge mirrors on all sides and even on the ceiling which is meant as vanity mirrors or simply for entertainment. You know how they love to see their dresses and new makeup. Speaking of which there are cases and drawers in the corners that hold all of the esthetic tools and props needed to make it the grandest extravaganza around. When you finally get to sit down on our comfy zebra printed couches, you’ll notice even more. We are offering revolutionary pedicures and manicures with our own special machines. There are TVs, too, that are connected to youtube and vevo for karaoke sessions. Our bus will also come with a set of hostesses who know all the ins and outs of the program and even more about the spa treatments we offer. All of these culminate into a bubbly cocktail of fascinating options that your daughter will be able to explore with her friends. What Makes Your Pedicures Revolutionary? There are plenty of places where you can get a pedicure, but not for the same exciting experience. You can’t have the spa drive to your doorstep. Yet, you can have Rockstar Spa Bus come right to you! Our pedicure machine is state of the art and the only one of its kind in Houston. No other spa bus has access to ours. This special machine comes with a pipeless system for making whirlpools. It also is made with a sturdy stainless steel footboard and a fiberglass base. It comes ready with a sprayer and a faucet for cold or hot water. There are even LED therapy lights that will glow in relaxing hues. We aren’t using any of the sharp instruments that an adult spa uses, but we still offer the same treatments. This is why we are one of the best party venues around, because we can provide great service at a price worth your time. Every woman who is concerned about her health has explored the local spas. They are great ways to relax and ease tension or pain in the body. Plus, they can make you look radiant and more beautiful with every treatment they give. It’s a wonderful chance to get the most comfort out of your body. However, if you have experienced the spa then you’ll also recall just how expensive they were. To merely get just one treatment you might have to pay over $100. It’s a worthwhile time but we wish for a lower cost! That’s where our Spa bus comes in because our work is exceptional for the price. We create an experience that captures all of the grandeur that traditional spas are host to. Except we are even better because Rockstar offers all of the treatments, from foot massages to facials, in the packages that our spa bus offers. What’s special is not only will you be paying cheaper per person for all of those spa treatments but your daughter can enjoy them with all of her friends, too! This is a special way of reminding her that she is the most important thing in your life. What better way than to provide your princess with an exclusive luxury package that does more than a regular spa for a fraction of the price it would cost! Contact Us For Your Spa Bus Party Now! We have the perfect setting to make your princess party a royal treat. It’s our pleasure to host such treasurable times that are affordable and accessible to you almost anywhere in Houston. We pride ourselves over giving the best birthday celebrations around for all the princesses out there. If you want your daughter to join in on the fun, and have her own personal taste of the sweet life, set up your appointment now! You can contact us at 1-844-GIRL-SPA (4475-772) for more questions or simply visit our website to schedule in your appointment now. We hope to hear from you soon!